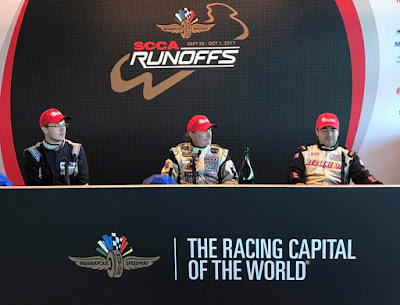 Oil spills, spin-offs, lapped traffic and tight racing defined the Formula Mazda (FM) Sports Car Club of America National Championship Runoffs® race. Defending his race line in the No. 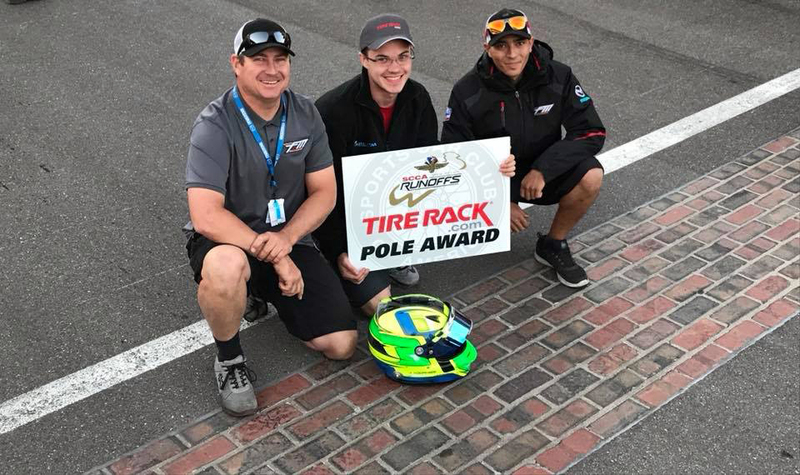 4 Mazda Goodyear Star Formula Mazda on the final lap, Melvin David Kemper Jr., of Toledo, Washington, took the checkered for his first national championship win at Indianapolis Motor Speedway on Saturday morning. Jarrett Voorhies, of Kissimmee, Florida, visited the SCCA national podium for the first time finishing second and Mike Anderson, of Anza, California, claimed third for the second time in his Runoffs career. The 16-car FM field completed 19 laps in the same session as the Formula Continental (FC) class. The first start was waived off, but Anderson took the lead on the second start attempt after Voorhies’ bobbled start. Voorhies, who dominated all four qualifying sessions, shuffled to the back of the field after a shunt in Turn 1. A full-course yellow caused by a FC oil spill allowed Voorhies to refire his No. 15 Mitchell Petroleum Star Formula Mazda and catch the field. On the restart, Kemper challenged Anderson for the lead. Right on the gearbox of the No. 42 HASA Pool Productions machine, Kemper accelerated from the draft and squeezed Anderson on the inside to take the top spot. Voorhies picked off cars one by one trying to catch the front-runners, but killed his momentum when he looped his car in Turn 10. He continued in sixth. Kemper and Anderson pulled away from the field with Liam Snyder, of Southlake, Texas, following in third. Kemper and Anderson continued to battle each other through the white flag. On the final lap, Anderson got caught in lapped FC traffic. Kemper extended his lead over Anderson and Snyder. Anderson fought to catch the race leader and on an attempt to overtake Kemper on the inside of the esses, spun off track. Close behind in third, Snyder’s podium-run ended after Turn 7 collected his Snyder Brothers Racing car. A prowling Voorhies capitalized on the shunts to take second. Anderson continued the race to finish third. Larry Mason, of Burbank, California, finished fourth in his No. 12 Auto Diagnostic Services/Polar car and Snyder recovered from his last-lap shunt to take fifth. Matt Stephenson of Oklahoma City earned the Sunoco Hard Charger award in the No. 08 Bell Helmets racecar. The 54th SCCA National Championship Runoffs, the Pinnacle of American Motorsports, crowns Sports Car Club of America’s Road Racing National Champions this year at Indianapolis Motor Speedway from Friday, September 29 through Sunday, Oct 1. While the live broadcast of all 28 National Championships is available at SCCA.com and Motor Trend OnDemand, each race will be on demand in the coming weeks. INDIANAPOLIS, Ind. -- Provisional results for Saturday’s FM race at the 54th SCCA National Championship Runoffs from Indianapolis Motor Speedway, with finish position, starting position in parentheses, driver, hometown, car and laps complete. (1), Jarret Voorhies, Kissimmee, FL, Star Formula Mazda, 19. (2), Mike Anderson, Anza, CA, Star Formula Mazda, 19. (5), Larry Mason, Burbank, CA, Star Formula Mazda, 19. (4), Liam Snyder, Southlake, TX, Star Formula Mazda, 19. (7), Brad Yake, Fort Worth, TX, Star Formula Mazda, 19. (11), Matt Stephenson, Oklahoma City, OK, Star Formula Mazda. (10), Nicholas Malone, Fate, TX, Star Formula Mazda, 18. (8), Karl Markey, Rosharon, TX, Star Formula Mazda, 18. (12), Victor Mauk, Flower Mound, TX, Star Formula Mazda, 18. (13), Terrance Carraher, Arroyo Grande, CA, Formula Mazda. (14), William Snyder, Southlake, TX, Star Formula Mazda, 18. (15), Court Dowis, Pine Mountain, GA, Star Formula Mazda, 18. (16), Rodger Fussell, Cresson, TX, Star Formula Mazda, 18. (9), Shane Doles, Eatonton, GA, Star Formula Mazda, 15. (6), Jason W Vinkemulder, Spring Lake, MI, Star Formula Mazda. My son, Moses Smith owns the rights to and is the manufacturer of the Formula Mazda car. This was an awesome race with a fairy tale ending. 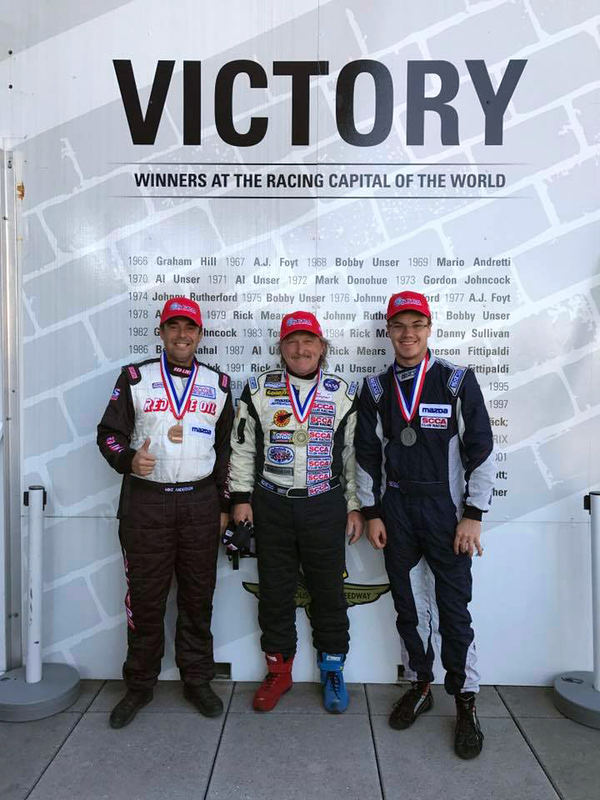 Mel has been racing these cars for over twenty years and this represents his first SCCA Run Off Title. Note: Did you know that Winner Mel Kemper is the great uncle of MX-5 Cup racer Drake Kemper?